Cancer. The word alone jars individuals to remember friends and loved ones lost to a disease that still challenges most practitioners. For a patient or family member, the questions continue after they walk out what was likely an emotional medical encounter. The questions are various, but finding the right answers often difficult. 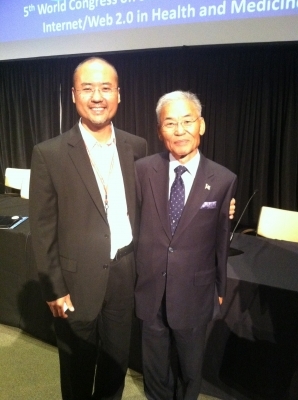 Jonathan Cho brought this home in a touching presentation at the the recently concluded Medicine 2.0 Congress in Boston. For those that attended the presentation, his personal story meant as much as the information he shared. He weaved together a story of a son and nephew watching multiple loved ones deal with cancer and his search to find answers. It was not hard to be touched by this story, and what it meant to Jonathan as an inspiration for his work. These moments instilled a passion in him for helping others to deal with a situation with which he is all too familiar. Jonathan is Chief of the Communications Technology Branch at National Cancer Institute. He deals with the integration of technology with information available at the NCI in order to help the community effectively engage and utilize the vast knowledge of the NCI. 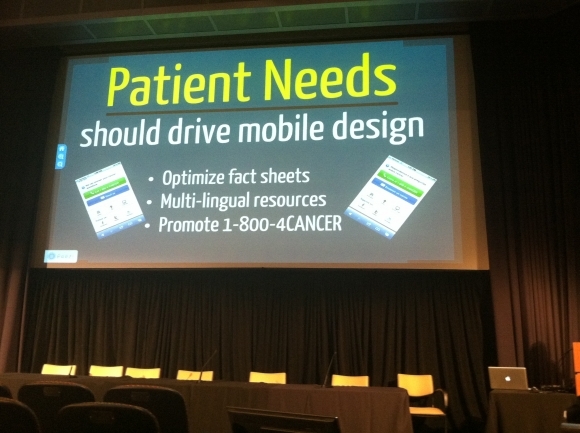 At the Medicine 2.0 Conference, he presented “Going Mobile – How User Research and Analytics Helped Shape Mobile Strategy at the National Cancer Institute,” detailing how the NCI has sought to bring knowledge through technology. The National Cancer Institute has seen a large increase in access of its content via mobile devices. This is of no surprise, especially in light of data from February 2012 that suggests 46% of American adults now possess smart phones, up from 35% just from the previous year. This coincides with the more than doubled visits to the NCI website from mobile devices. Taking this into consideration, NCI took the initiative to address the utilization of their web content via smart devices. The first consideration in this plan was whether to make an mobile device app or create a mobile web app. Jonathan elaborated that the NCI embraced the COPE model, or ‘Create one and publish everywhere,’ and decided not to pursue a mobile app. The primary reason would be that cross platform maintenance would be time consuming and some populations may be missed, which is contrary to NCI goals of supplying information to the public. After development of a mobile web app for access by smart devices, the issue became what information to concentrate on being incorporated. 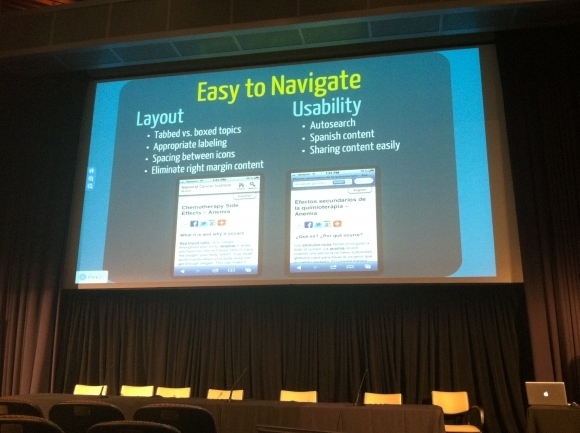 The NCI tracked mobile content search patterns and access to recognize what was pertinent (e.g. coping with cancer) to users. Additional information was tested among visitors as to what they were primarily looking for. The target population was recognized to be patients, friends, and family members of cancer patients. As such, an emphasis on healthcare providers was not the primary goal of the mobile NCI website. Information that would be supplied via the mobile web app is structured for ease of health literacy and with topics relevant to those with differing forms of cancer. Another interest of the NCI was to increase access to Spanish speaking populations. It was determined that mobile visits to the spanish version of the website had tripled in previous year, and this coincides with the data that supports hispanics heavily utilizing mobile devices to access the internet. Integration of the mobile NCI site with ease of access for spanish language was then seen as a prime concern and integrated into design. Lastly, increasing awareness to the 1-800-4Cancer phone service was also promoted through the design of the mobile site. The mobile web app was rolled out in January 2012. Since that time, they have seen a large increase of calls and access of Spanish language sites. Jonathan spoke of how this endeavor by the NCI may have large ramifications for the overall population that face cancer, just as he did years ago. Near the end, he revealed that he was the child that he described in the beginning and how he struggled to find answers for his uncle and later his father when they developed cancer. Then he identified his father and family members in the audience and spoke of how support has gotten him this far and helped his own family. It was a touching moment that really brought home the one thing technology sometimes misses – the human element. Never in history has such knowledge been available in a single device that fits in the palm of our hands. Johnathan’s hope, and mine, is that other organizations take the initiative to increase access to information for the overall population, in order to help those facing stressful times reach answers.